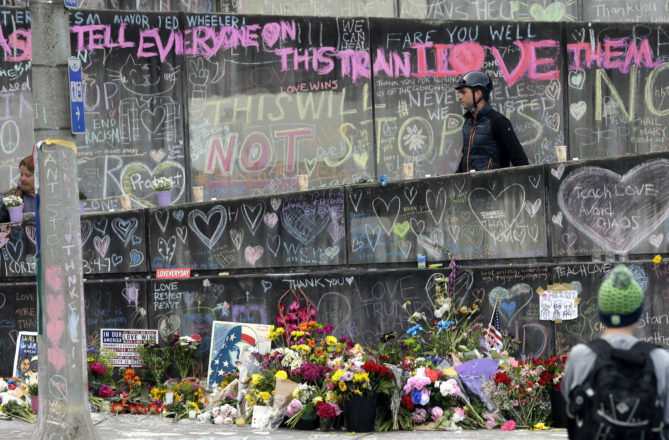 A bicyclist walking his bike down a ramp in Portland, Ore., is surrounded by messages, flowers, images and candles at a memorial for two men fatally stabbed on a light rail train. Since the election of Donald Trump, we’ve paid close attention to reported surges in hate crime and hate-fueled incidents across the country. Each week, in The Hate Report, we’ve outlined some of the trends in hate-related crime in America, including spikes in anti-Semitic and anti-Islamic incidents. And we’ve taken a deep-dive look at how an ancient neo-pagan religion is inspiring white supremacist terrorists to kill in the name of Nordic gods. As part of that, we became part of a larger movement with newsrooms, academic institutions and civil rights groups to do what federal and state law enforcement agencies have long failed to do: document hate crimes and hate-related incidents as comprehensively as possible across the entire United States. Documenting Hate, a project we’re participating in that’s led by ProPublica, collects hate incidents and hate crime reported directly by victims or witnesses. Just fill out the form below and your report will be included in the Documenting Hate database. The data we collect will help tell important stories, like BuzzFeed News’ recent article examining how children across America are invoking President Trump’s name in racist attacks on fellow students. Help us document hate as it happens.